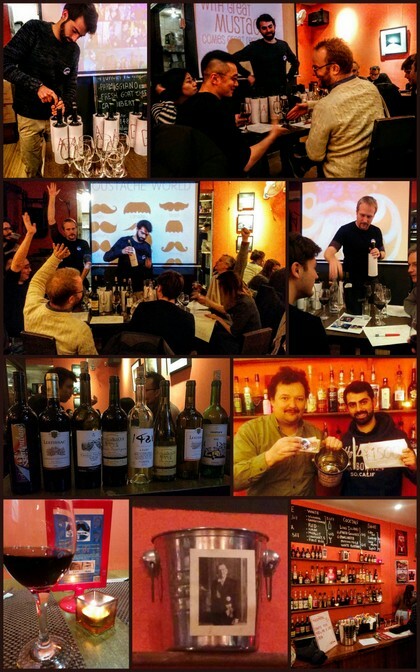 Wine aficionados tested their palates during Maovember when they gathered at Cafe de la Poste to see if they could tell French and Chinese wines apart. Each participant paid rmb100, which was donated to charity, and then blind-tasted four pairs of wine, with each including a French and a Chinese pour. There was plenty of discussion and debate — and general agreement that picking wines with labels unseen is no easy task! The French wines were donated by Cafe de la Poste while the Chinese wines were donated by East Meets West (Chateau Nine Peaks), Torres China / Everwines (Grace Vineyard), 1421 Wines (1421) and Grape Wall of China (Kanaan). Adding even more fun to the evening, Cafe de la Poste hosted “Office Basket-Bola“. People paid rmb 5 to write their name on a piece of paper, scrunch it up, and then take a shot at the bucket on the bar’s top shelf. Every shot that went in resulted in a prize of a free shot of booze. All in all, wine, basket-bola and donations totaled rmb1664.8!